The town of Philipsburg boasts the remains of two historic forts that bear witness to its one-time strategic importance for the Dutch. 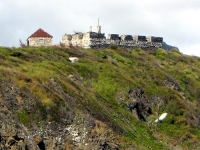 Fort Amsterdam, the first Dutch military establishment in the Caribbean, was built in 1631 on a peninsula between Great Bay and Little Bay, but it was captured almost immediately by the Spanish. The Spanish later abandoned it and the little fort returned to Dutch hands, being kept in use right up to the 1950s as a signalling and communications station. Interestingly, Fort Amsterdam has become an important breeding site for brown pelicans. The other Dutch fortification, Fort Willem, lies to the west of downtown Philipsburg, topped with a television transmission tower. Both forts are worth the walk to visit, particularly for the panoramic views afforded from their elevated positions. Not to be outdone, the French have their own historic fort. Fort St Louis was built according to plans sent from France by Louis XVI in 1767 to guard the settlement from invaders. It is St Martin's largest historical monument and looks out over Marigot. The ruins sit atop a hill, which is worth the steep 15 minute climb for the panoramic view of the island afforded from the summit. Open 24 hours a day, the area has many signs detailing important historical events.